The Wind Drop Banner Flag's unique shape is ideal for broader images and is a natural attention getter. All our Wind Drop Banner Flags are digitally printed using dye sublimation printing and high quality water based inks. This method provides excellent image reproduction with vibrant, fade resistant images. The use of water-based inks is also eco-friendly. Multiple Banner Flags create an eye-catching display at any event. Image seeing bicycles circling the different sporting events, concerts, shopping malls, parades etc, etc. The Wind Drop Banner Flags are perfect for mobilizing your business on bicycles and they look great outside your storefront at ground point. On single side reverse image the Wind Drop Banner Flag images are viewable from both sides. The front side reads correctly. The backside image is reversed, or mirrored. On true two-sided Wind Drop Banner Flags the images are viewable from both sides. Both the front and backside read correctly. All our Banner Flags can be machine washed in cold water and cool dry. Available in 8', 10' and 12' sizes. Pole is included in Banner Flag purchase price. You will need to choose a base depending on your desired use. To see our base choices see Accessories. We are a leading manufacturer of custom Banner Flags. Our Banner Flag construction, using 200 denier polyester, has reinforced pole pockets that are triple stitched at all stress points. All Banner Flags are digitally printed using dye sublimation printing and high quality water based inks. This method provides excellent image reproduction with vibrant, fade resistant images. The use of water-based inks is also eco-friendly. Our Wind Flutter Banner Flag, sometimes known as Feather Flags, have an unusual shape and a straight pole pocket. The Wind Flutter Banner Flags are fun and colorful and draw attention wherever they are placed. 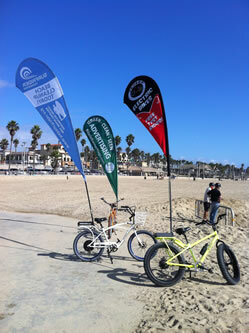 The Wind Flutter Banner Flags can be placed on site within minutes using our convenient modular pole assembly system. On single side reverse image the Wind Flutter Banner Flag images are viewable from both sides. The front side reads correctly. The backside image is reversed, or mirrored. On true two-sided Wind Flutter Banner Flags the images are viewable from both sides. Both the front and backside read correctly. All our Banner Flags can be machine washed in cold water and cool dry. Available in 8', 10' and 12' sizes. The Wind Runner Banner Flags are our most popular selling banner flag because they provide height and visibility for any message, We have engineered our banner flags to curve at the top so the flag will be visible with or without wind. The Wind Runner Banner Flags are designed to work with our modular poles for optimum fit. The Wind Runner Banner Flags unique shape is ideal for any logo images and is a natural attention getter. Multiple Banner Flags create an eye-catching display when riding around at different sporting events, concerts, shopping malls, parade and most any street or boulevard. On single side reverse image the Wind Runner Banner Flag images are viewable from both sides. The front side reads correctly. The backside image is reversed, or mirrored. On true two-sided Wind Runner Banner Flags the images are viewable from both sides. Both the front and backside read correctly. All our Banner Flags can be machine washed in cold water and cool dry. Available in 8', 11' and 13' sizes.